Slack in the labor force and could very well be one of the main forces behind the lower-than-expected inflation rates. Minneapolis Fed President Kashkari recently said he believed there is slack in the labor force not captured by the unemployment rate. 79% of the fall in the labor participation rate is purely demographic, according to the Peterson Institute. This fall represents the aging baby boomers exiting the workforce. The combination of the Peterson Institute's study in relation to the fall in the labor participation rate as well as the statistics from the BLS and ShadowStats indicate that there may very well be additional slack in the labor force. If Minneapolis Fed President Kashkari is correct in his belief that we have slack in our labor markets as discussed, combined with slower economic growth, the Federal Reserve may very well have enough room to cut Fed fund rates, should economic conditions warrant. Several economists believe the labor force is much larger than what is currently being reported. They referred to this as slack in the labor force, which could very well be one of the main forces behind the lower-than-expected inflation rates. There are several macro reasons for the Fed’s limited success in its efforts to inflate the economy. With the 74 million baby boomers moving into retirement, we have seen consumption slow in this aging demographic. Simply put, outside of healthcare, their needs are much less than those of age 25 to 54. 70% of the gross domestic product (GDP) is determined by consumption. That is precisely the reason demographics is so important to the overall economic growth. Of late, we have seen a positive trend in wage growth, and that positively contributes to increased consumption. However, wage growth is restrained due to the lack of productivity. Hopefully, with new technology, we will see improvement sooner rather than later. Minneapolis Fed President Kashkari recently said he believed there is slack in the labor force not captured by the unemployment rate. Under normal circumstances, you would see a 3.8% unemployment rate and conclude the labor markets were very tight and wage inflation would naturally be the result. The idea of a tight labor force is further supported by the most recent announcement that we have 7 million job openings with only 6 million unemployed workers. Keep in mind, those numbers do not consider the historically low labor force participation rate and are probably overstated. 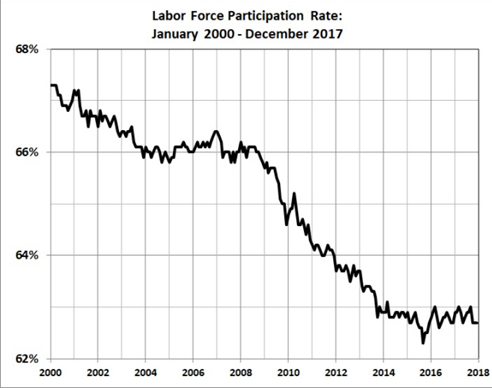 The participation rate is the percentage of the US population available to the labor force excluding those incarcerated, institutionalized or simply discouraged and not looking for employment. According to the Bureau of Labor Statistics February’s nonfarm payroll report, the employment participation rate is currently 63.2%. As people come in and out of the labor force, that number can vary. Here is a chart reflecting the fall in the participation rate since 2000. 79% of the fall is purely demographic, according to the Peterson Institute. This fall represents the aging baby boomers exiting the workforce. That would leave 21% of the slide in the participation rate as those underemployed and discouraged workers who are just not looking for work. This 21% might explain the additional slack we could have in the labor force. We have two official unemployment readings as reported by the Bureau of Labor Statistics. The headline number is U3, and it is currently at 3.8%. The second is referred to as the U6, and this number includes underemployed workers as well as those no longer seeking employment. The most recent U6 reading was 7.3%. There is a third even broader unemployment reading done by ShadowStats. It is substantially higher than the broader U6 reported by the BLS. The seasonally adjusted SGS Alternate Unemployment Rate reflects current unemployment reporting methodology adjusted for SGS-estimated long-term discouraged workers, who were defined out of official existence in 1994. That estimate is added to the BLS estimate of U-6 unemployment, which includes short-term discouraged workers. The U-3 unemployment rate is the monthly headline number. The U-6 unemployment rate is the Bureau of Labor Statistics’ (BLS) broadest unemployment measure, including short-term discouraged and other marginally attached workers, as well as those forced to work part-time because they cannot find full-time employment. 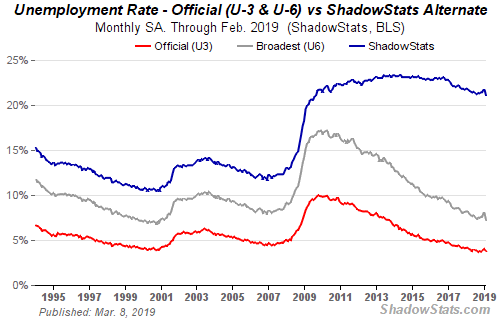 The ShadowStats Alternate Unemployment Rate for February 2019 is 21.1%. The combination of the Peterson Institute’s study in relation to the fall in the labor participation rate and the statistics from the BLS and ShadowStats indicate there may very well be additional slack in the labor force. 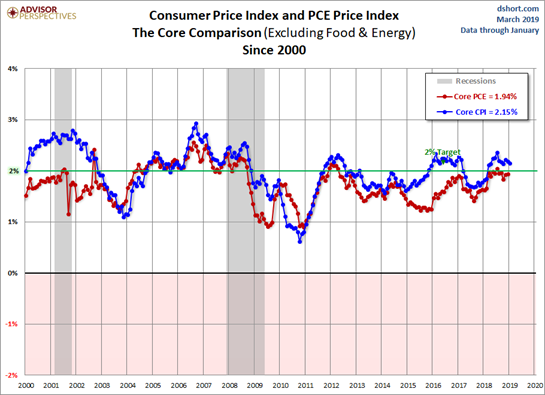 Though we see improvements in wages, the Federal Reserve has had trouble in reaching its targeted inflation rate of 2%, as seen in the chart below. Kashkari’s position on labor could very well explain why we have not seen inflation tick up with increases in wages. Clearly, we are witnessing slower economic growth. According to Atlanta’s Fed’s GDPNow, it appears that the first quarter of this year GDP will come in at approximately 1.7%, substantially lower than the 3.1% experienced in 2018. Most economists believe this is due to slowing global economies, primarily in China and Europe. Naturally, this would have a negative impact on US GDP. To make matters worse, we have just witnessed an inverted yield curve between the 3-month treasury and the 10-year treasury. Though today the yields are relatively flat, the earlier inversions historically have been a precursor to a coming recession 12 months down the road. The Fed has indicated its concern and is monitoring the situation closely. With the 10-year treasury yielding 2.4%, down from 3.18% less than six months ago, the Fed hopes the drop in yield will jump-start the housing and construction sectors, which have been weak of late. The Federal Reserve is projecting solid economic growth of approximately 2.2% for 2019. At the same time, it has indicated that there would be no more rate hikes this year and that it would stop shrinking its balance sheet as of September. Maybe the rest of the FOMC members are coming around to the idea that there is additional slack in the labor force as Kashkari suspects. The question now becomes whether the next move the Fed makes will be a reduction in Fed funds rates rather than an increase. If Minneapolis Fed President Kashkari is correct in his belief that we have slack in our labor markets as discussed, combined with slower economic growth, the Federal Reserve may very well have enough room to cut Fed fund rates should economic conditions warrant. Additional disclosure: You should consider your personal financial situation, investment objectives, risk tolerance and needs prior to making investment decisions. Not all strategies discussed may be suitable for all investors. Investment advisory services offered through World Equity Group, Inc., member FINRA and SIPC, a Registered Investment Adviser. Dogwood Capital Management is not owned or controlled by World Equity Group, Inc.